At the age of thirteen Thomas read his first novel, Dune, by Frank Herbert. That was the spark that ignited his passion for reading. It was the popular fantasy Dragonlance novels by Tracy Hickman and Margaret Weis which cemented his love of fantasy. He grew up devouring those heroic tales of swords and sorcery. He feels if even one person reads his work and experiences that seed of excitement he still experiences from a good science fiction or fantasy read, it will all have been worth it. Cradle of the Gods by Thomas Quinn Miller is a YA fantasy novel. Young Ghile, who lives in the Cradle, is of age to take part in a traditional celebration that means the start of manhood. But will he suffer the same fate as his older brother and be culled by the vicious dwarves? This is not all Ghile has to contend with. When he stumbles upon a strange statue inside the forbidden ruins, he becomes a “stonechosen” and finds he has some extraordinary abilities. Ghile’s people, the surviving humans, live simply and obediently in order to survive the power games or struggles of the dwarves, elves, sorcerers and gods. But things are changing – it’s the time of the “stonechosen” and Ghile finds himself caught up in an exciting but perilous mission. 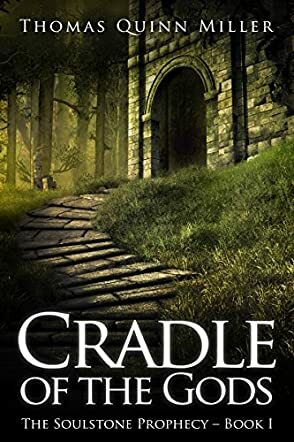 Cradle of the Gods has a wonderfully well-crafted plot that moves at a good pace and takes the reader on a gripping journey of fantasy, magic, discovery and peril. I like the way the world of the characters is revealed gradually as the story unfolds – we discover the background and intricacies of Ghile’s world as he encounters events himself. I found myself sharing in his bewilderment, fears and determination, and rooting for him to survive and succeed in his mission. The many characters are wonderfully varied with strong, well-defined personalities and motivations. I especially liked Gaidel, druid daughter of the All Mother who connects through song to nature and life and her words: “Life was…an eternal song one had to join to find harmony”. Her philosophy adds to the book’s extra message about life and meaning. Thomas Quinn Miller’s brilliant imagination has created an array of captivating, powerful and believable beings and species that interact and attempt to wield their influence and powers over one another. I was reminded at times of the conflicts and challenges characters faced in the world of Lord of the Rings. The story kept my interest throughout and ends with the indication of further missions and challenges for young Ghile and his friends – enticing the reader into future sequels of the book. Excellent vivid writing, great story and characters, and all the ingredients of an imaginatively entertaining, thought-provoking and action packed fantasy. Recommended. Ghile had never been one to stand out or excel at anything; he was not even sure he would pass the upcoming Manhood test. As such, he was the victim of the two village bullies who considered him too weak to fight back. It was during one of the encounters with the bullies that Ghile, in an attempt to escape their torture, did the unthinkable and entered the forbidden ruins. Since the Great Purge that brought them to near annihilation, humans were not allowed to enter the ruins. However, Ghile's experience in the ruins brought about the most extraordinary - and for many the most feared - results, making him the stonechosen and hence placing in him the only hope for fulfilling a prophecy that would liberate his race. There are many eager to see him succeed, but not as many as powerful and ruthless as those that want to stop him, whatever the cost. The Cradle of the Gods (The Soulstone Prophecy Book 1) by Thomas Quinn Miller is the first part of what is certain to be a blockbuster YA fantasy series. Thomas Quinn Miller created an extraordinary story flawlessly delivered through impeccable writing, an epic cast of memorable characters, and a unique setting, all of which blended together perfectly to create this remarkable world of the Cradle and its surroundings. The intricate plot comes together with one part flowing into the next to bring to life one of the most memorable fiction fantasy stories I have read. I am excited for the journey Ghile is embarking on. I cannot wait to see where it leads him and his accomplices, and all the challenges they will have to overcome in an attempt to fulfill the prophecy. The Cradle of the Gods is a young adult fantasy adventure by author Thomas Quinn Miller, and the first book in the Soulstone Prophecy. Our central hero is shepherd Ghile, one of the last humans in the kingdom of Allwyn where dwarves reign supreme, who resides in the title’s Cradle of the Gods until his life takes a terrible twist. Marked as the Stonechosen, Ghile wields the hidden powers of the gods themselves, if indeed he can learn the complex conditions necessary to use them, and there are other figures of power ready to hunt him down and prevent him from fulfilling his destiny. So begins a high fantasy adventure in a lavish and intriguing world. It is delightful to find a detailed, immersive fantasy world which does not bog the reader down in page loads of lore and history. The realm of Allwyn, its magical system, gods and everyday ways are delivered to the audience in a stylish and highly readable narrative with Thomas Quinn Miller’s imaginative prose. Ghile is a likeable hero, but for me the supporting cast were superbly fleshed out, each making a new mark on the world as you meet them and never a disappointment. My particular favourite was the enigmatically named Two Elks, though apprentice Riff made a close second. Equally plot driven and character driven in nature, Miller strikes a storytelling balance which is rarely found in fantasy of this ilk. Expect dwarves and gods, heroes and monsters, but so much more. Don’t miss The Cradle of the Gods.